The International Humanitarian Studies Association is a network engaged with the study of humanitarian crises caused by natural disaster, conflict or political instability. Although the Genocide Convention was already adopted by the UN General Assembly in 1945, it was only in the late 1990s that groups of activists emerged calling for military interventions to halt mass atrocities. The question of who these anti-genocide activists are and what motivates them to call for the use of violence to end violence is undoubtedly worthy of exploration. Based on extensive field research, Anti-genocide Activists and the Responsibility to Protect analyses the ideological convictions that motivate two groups of anti-genocide activists: East Timor solidarity activists and Responsibility to Protect (R2P)-advocates. The book argues that there is an existential undercurrent to the call for mass atrocity interventions; that mass atrocities shock the activists’ belief in a humanity that they hold to be sacred. The book argues that the ensuing rise of anti-genocide activism signals a shift in humanitarian sensibilities to human suffering and violence which may have substantial implications for moral judgements on human lives at peril in the humanitarian and human rights community. 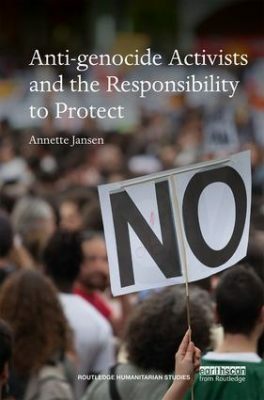 This book provides a fascinating insight into the worldviews of activists which will be of interest to practitioners and researchers of human rights activism, humanitarian advocacy and peace building.